Bees, mosquitoes, fire ants, ticks and spiders are not covered. See those care guides. Insect bites usually cause a small red bump. Often, it looks like localized hives (one large one or several small ones). Sometimes, a small water blister occurs in the center of the bump. This is common in younger children. Itchy Insect Bites. Bites of mosquitoes, chiggers (harvest mites), fleas, and bedbugs usually cause itchy, red bumps. Painful Insect Bites. Bites of horseflies, deer flies, and gnats usually cause a painful, red bump. Fire ants, harvester ants, blister beetles, and centipedes also cause a painful, red bump. Within a few hours, fire ant bites can change to blisters or pimples. The skin bumps are the body's reaction to the insect's saliva. The main symptoms are difficulty breathing and swallowing starting within 2 hours of the sting. Onset usually is within 20 minutes. Anaphylaxis can occur with bee, yellow jacket, wasp, or fire ant stings. Anaphylactic reactions are very rare after other insect bites. Reason: other insects don't have venom. Impetigo. A local bacterial infection. Gives sores, soft scabs and pus. Caused by scratching or picking at the bites. More common in itchy bites. Cellulitis. The bacterial infection spreads into the skin. Gives redness spreading out from the bite. The red area is painful to the touch. Most insect bites cause a red bump. Some are larger (like a hive). Some have a small water blister in the center. These are normal reactions to an insect bite. A large hive at the bite does not mean your child has an allergy. Steroid Cream. To reduce the itching, use 1% hydrocortisone cream (such as Cortaid). No prescription is needed. Put it on 3 times a day until the itch is gone. If you don't have, use a baking soda paste until you can get some. If neither is available, use ice in a wet washcloth for 20 minutes. Also, you can put firm, sharp, direct, steady pressure on the bite. Do this for 10 seconds to reduce the itch. A fingernail, pen cap, or other object can be used. Allergy Medicine. If the bite is still itchy, try an allergy medicine (such as Benadryl). No prescription is needed. Sometimes it helps, especially in allergic children. Soak a cotton ball in a baking soda solution. Rub the bite with it for 15 to 20 minutes. Do this once. This will usually reduce the pain. You can also use an ice cube in a wet washcloth for 20 minutes. For painful bites, allergy medicines don't help. If the insect bite has a scab on it and the scab looks infected, use an antibiotic ointment. An example is Polysporin. No prescription is needed. Use 3 times per day. (Note: Usually impetigo is caused by scratching with dirty fingers). Cover the scab with a bandage (such as Band-Aid). This will help prevent scratching and spread. Wash the sore and use the antibiotic ointment 3 times per day. Cover it with a clean bandage each time. Do this until healed. Caution: For spreading infections (redness or red streaks), your child needs to be seen. Most insect bites are itchy for several days. Insect bites of the upper face can cause severe swelling around the eye. This is harmless. The swelling is usually worse in the morning after lying down all night. It will improve after standing for a few hours. Wear long pants, a long-sleeved shirt and a hat. Avoid being outside when the bugs are most active. Many insects that cause itchy bites are most active at sunrise or sunset. 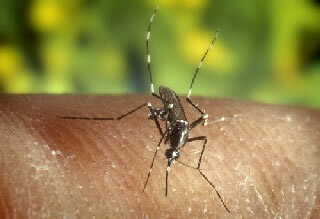 Examples are chiggers, no-see-ums, and mosquitoes. Insect repellents that contain DEET are helpful in preventing many insect bites. Read the label carefully. DEET Products: Use on the Skin. DEET is a very effective bug repellent. It also repels ticks and other insects. The AAP approves DEET use over 2 months of age. Use 30% DEET or less. Use 30% DEET if you need 6 hours of protection. Use 10% DEET if you only need protection for 2 hours. (AAP 2003). Put it on exposed areas of skin. Do not use near the eyes or mouth. Do not use on skin that is covered by clothing. Don't put DEET on sunburns or rashes. Reason: DEET can be easily absorbed in these areas. Caution: DEET can damage clothing made of man-made fibers. It can also damage plastics (such as eye glasses) and leather. DEET can be used on cotton clothing. Permethrin Products: Use on Clothing. Products that contain permethrin (such as Duranon) work well to repel insects and ticks. Unlike DEET, these products are put on clothing instead of skin. Put it on shirt cuffs, pant cuffs, shoes and hats. You can also use it on other outdoor items (mosquito screens, sleeping bags). Do not put permethrin on the skin. Reason: Sweat changes it so it does not work. Picaridin is a repellent that is equal to 10% DEET. It can safely be put on skin or clothing. The photo shows a female mosquito feeding on a human host.